The railway line from Inverness to Kyle of Lochalsh is famed for its beauty. 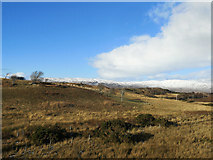 Together with the more publicised “Harry Potter” line that includes the Glenfinnon viaduct on its way from Fort William to Mallaig, and the wilderness route to Fort William over Rannoch Moor, the majority of the passengers who use the lines are tourists out for the ride and experience. 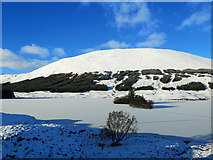 Each year my wife and I plan a winter journey from the Inverness area on one of the North Highland lines. The choice is either the run to Kyle of Lochalsh or the longer journey to either Wick or Thurso. In the winter the timetables make a day return to Kyle of Lochalsh a great option as all the route at least from Dingwall, our natural starting point, is seen in daylight. The crucial aspect is the weather. Living in the Highlands we can choose the day the weather promises to be at its best and even buy a cheap Advance ticket the day before. Dingwall to Kyle return with a Senior Railcard can be bought for £13.70. The morning train leaves Inverness at 0855 and arrives at Kyle at 1130. In winter we usually stay at Kyle for two and a quarter hours and catch the 1346 train back, which reaches Inverness at 1626. Two and a quarter hours in Kyle is always enjoyable. First or last stop, Buth Bheag the small seafood shack opposite the town’s coach stop in the centre of town. Cullen Skink or sea food salads are quite superb and you can get a drink and sit outdoors in the sun. Then our usual walk - an exploration of the Plock of Kyle. This is very close with many footpaths, narrow and wide, to the coves of this promontory. Away from the shore there are orchids in summer and it is difficult to reconcile this conservation area with its former role as a golf course. 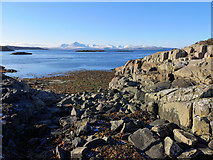 The small bays have have been used as a major study area for seaweeds, and if you are an ultimate planner, see if you can choose a day with low tide for your time at Kyle. 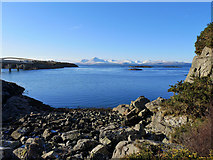 The high point of the Plock is a purpose-made viewpoint which provides a wide panorama of Skye and shows the Skye Bridge to good effect. In winter the trains are empty, so you can easily move around from side to side of the train for the best views. In summer I would be frustrated if I was “locked” in just one seat, as could potentially happen. 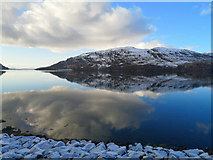 For the most scenic part of the journey from Strathcarron Station to Kyle along Loch Carron you must be on the right-hand, loch-side of the train. An absolute must!!! So, if you are on a full train choose your seat for this section alone. My approach is to only take images at 90 degrees to the train, by “anchoring” the camera to the glass, so the lens cannot catch reflections, and if you have a clean window, whatever imperfections there are on the glass will be invisible. The trip illustrated here used a Ricoh GXR with M mount and Leica 21 mm lens (equivalent to a 30 mm lens) for the outward journey, and a Huawei P20 Pro Smartphone with its equivalent 27 mm lens for the return. The Huawei in a protective case was flat against the window, an easier option than keeping the Ricoh’s lens hood against the glass. There are many images of the Plock of Kyle at NG7527 which will complement the ones here, and perhaps persuade others who find themselves in Kyle to take a walk on the Plock. For those who don’t like to part with their car for a day, and are on the west coast, you could enjoy the highlights of the train ride by taking a day return from Strathcarron to Kyle. A study of the map will show you that from Stromeferry to Kyle no car can replicate what you can see from the train. You are right at the water edge with a grandstand view. I apologise that my Garmin GPS was set to record at 30 second intervals. For a moving train it should have been 5 seconds. So, the GPS track is a quite segmented and not a smooth curve, and this will also mean that the GPS location of my images (interpolated from the Garmin) will be correspondingly out. I will know next time. However I have adjusted where necessary the camera position to be on the railway line. Looking towards the sun in the west on the final approach to Achnasheen Station. 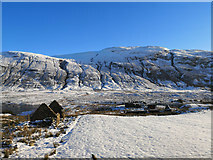 A crisp landscape with excellent visibility. 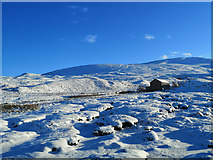 A managed environment at Attadale. A view from the train bound for Kyle of Lochalsh. As seen from the train heading to Kyle of Lochalsh. A fine view to the west and north. The second beach visited on an unstructured exploration of the Plock of Kyle. The train hugs the coast giving unparalleled views of the seashore. The scenery changes at each turn as the train heads slowly on beside the sea. 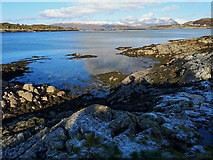 An uninterrupted view of the surroundings of Plockton. The train was slowing to allow a passenger to alight. 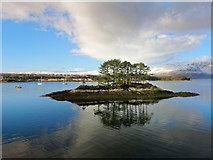 A distinctive island by the shore of Loch Carron near Craig. Shaded from the afternoon sun. 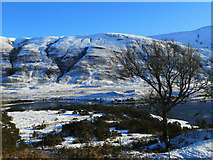 A mountain with much snow seen to advantage from he south side of Loch Carron. The railway crosses the road at Balnacra close to the buildings. Leaving the tree-covered lower slopes of Glen Carron heading for Achnasheen on the train. 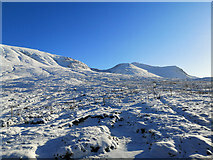 The hillside stretches up to Moruisg in the Glencarron and Glenuig Forest. Two islands with trees and an outlier by the near shore. As seen across Strath Peffer on the descent from Raven Rock on the Inverness-bound train. All images © Julian Paren and available under a Creative Commons licence .